Blood draw at Kaiser’s South Kona Clinic. I don’t think I’d been drawn by Lewis before: he poo-pooed any talk of wiggly veins and popped me in my left arm, first try. Good man. The hospital where they will do radiation work is about 2 miles further down the pike, so a 65 or 70 mile round trip, five days a week. Not looking forward to it. Knitwits meeting at 1:00. I have lucked into a group of friendly, intelligent, and tremendously supportive women, and am very grateful for it. At least five of the women are cancer survivors, so we talked about that for a while, then veered off to other subjects. I don’t know how we got on the subject of odd names, but I told the story of Nell collecting names when she worked pediatric reception at Kaiser Oakland, back when I was a kid. I mentioned Windorla and Edmonia and Captain Wolf Perry (a newborn), but when I brought up E Pluribus Eubanks, Anne chimed in with the last name, and laughed. Anne’s partner had worked as a paralegal in the criminal justice system in Alameda County, and E Pluribus had been a fairly regular visitor, for a variety of misdemeanor charges. Small world indeed. This entry was posted in Grrrr, Health, Language on July 5, 2015 by Administrator. The rainbow is the official symbol of Hawai’i, and here it is on my brand new license plates. I like the ZAZ part — the last California plate I had included the letters VAK, which always made me think of a vacuum cleaner. 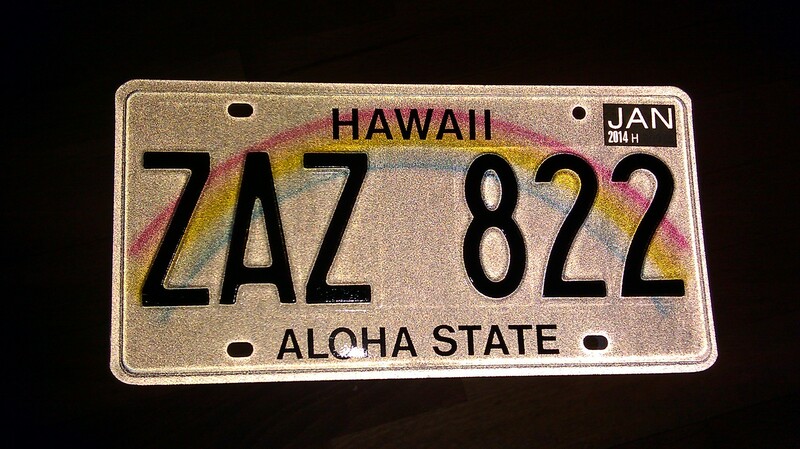 Yesterday I spent three hours at the motor vehicle department, registering the car and getting new plates, but also getting a Hawai’ian driver’s license and registering to vote. I am now, officially, a citizen of the Great State of Hawai’i, and pleased to be so. ~ Aloha ʻoe, may you be loved or greeted, greetings (to one person). ~ Aloha kāua, may there be friendship or love between us, greetings (to one person); ~ ~ ~ Aloha kākou, same as above, but to more than one person. Here’s an interesting essay on The Deeper Meaning of Aloha if you want to read more about it. This entry was posted in Beginnings, Language on March 16, 2013 by Administrator.